In the previous chapter we looked at how to find out if a company was any good or not. In a nutshell, good companies get back a lot of profit or cash flow as a percentage of the money they invest – they earn high financial returns. As a private investor buying the shares of a company you should probably be trying to achieve the same thing if you want to grow the value of your savings. To do this you have to buy a share as cheaply as you can. This sounds simple in theory, but in practice is actually very difficult. To have a chance of doing this, you need some tools that will help you weigh up the value of a share. In this chapter, I’m going to take you through some of the valuation ratios that SharePad has to offer. I’ll start off with the basic ratios and then get into some more advanced stuff later on. SharePad has lots of valuations ratios. 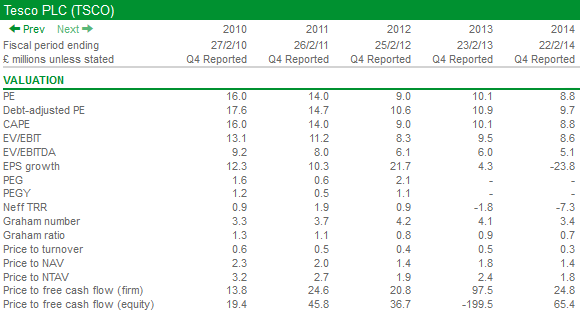 You can see the ratios for Tesco in the table below. To the novice investor, they can easily look like a set of meaningless numbers. But they can help you decide whether to buy a share or whether one has become too expensive and should be sold. The PE ratio compares the current share price of a company with the profits attributable to that share (earnings per share or EPS). It can be based on different measures of EPS but SharePad bases its calculation on the underlying or normalised EPS. What the PE ratio is essentially telling you is how many years of current profits are reflected in the share price. So if a company has a share price of 100p and EPS of 10p it will have a PE ratio of ten times current EPS. If the share price was 200p, the PE ratio would be twenty times EPS. The number of times EPS is reflected in the share price is sometimes referred to as the PE multiple – the multiple of profits or EPS. With one or two exceptions, companies that are expected to grow their profits strongly in the future see their shares trade on higher PE multiples than those that are struggling to grow or shrinking. As you can see from the table, Tesco at the time of writing was trading on a PE ratio of 8.2 times. Back in 2010, the PE multiple was 16 times. The fall in the PE ratio since then is a clear illustration of how investors have become more downbeat about Tesco’s future profits. Whether that is the right PE multiple is impossible to say without the benefit of hindsight. I’ll have more to say on this in the chapter on value investing. You may be quite comfortable thinking about shares in terms of PE multiples and that high numbers mean a share is more expensive than low ones. If you find this a little bit confusing then help is at hand. In the last chapter, we looked at expressing company returns in terms of interest rates to make them more meaningful. Well, you can do the same with investor returns such as the PE ratio. To turn the PE ratio into an interest rate so that you can compare it with other investments such as bonds or savings accounts you just turn it upside down or invert it. This gives you a number that is known as the earnings yield. So let’s look at Tesco again. It has a PE ratio of 8.2 times. If we turn that upside down then this would give us an interest rate or earnings yield of 12.2% (one divided by 8.2). Now, that might look tempting compared with the interest rates on bonds or savings accounts and could be a sign that Tesco shares are good value. Maybe, but whether you will make money on the shares depends on the earnings that Tesco will produce for shareholders in the future. You can use the earnings yield as a way of showing you the interest rate on the shares that you buy. If you buy a share with growing profits then the interest rate that you will get on the price you paid for the share will go up. If profits fall then the interest rate will fall too which can coincide with a falling share price and you losing money. I’ll show you what I mean when looking at Tesco. Until 2013, things were looking reasonable. The buyer of Tesco shares at 420p was getting a rising return on their investment based on its EPS. In 2014, profits and returns fell. What’s even worse is that the share price is now 230p, Why is this? The main reason is that investors expect Tesco’s profits and EPS to be a lot lower in the future than they were in the past. I’ll explain more in the next section. The problem with PE ratios in their basic form is that they are based on profits that have already been reported. This is information that is known by lots of people. Share prices don’t tend to be based on what happened in the past but on what is likely to happen to profits in the future. You might be thinking how on earth you can know work out what next year’s EPS will be. The good news is that you don’t have to. Professional investment analysts spend most of their working day scrutinizing company accounts and industry trends so that they can try and predict future profits for companies. Some of these forecasts are based on very sophisticated models. Others are part guesswork based on the assumption that the current trend in profits will continue. SharePad collects forecasts from a selection of analysts and calculates an average EPS forecast. This is used to calculate the prospective PE ratio. This might explain to you why Tesco’s share price has fallen so much. As you can see Tesco’s profits are expected to be significantly lower than they have been historically. They now trade on a very high prospective PE ratio of 23.2 times rising to 26.7 times and offer very low earnings yields. Does this mean that Tesco shares are very expensive? Maybe. However, an important point to note about PE ratios is that they can be very high when profits (the EPS bit of the PE ratio) are low. These PE ratios can be justified if profits can rebound back to previous levels. As a shareholder, a company’s earnings per share is your share of the annual profits. However, unless you own all of the company this is usually not what ends up as cash in your pocket. That depends on the amount of those profits that are paid to shareholders as a dividend. Whilst profits can move around a lot from year to year, dividends per share tend to be more stable. The amount of dividend paid tends to be based on what the directors of the company believe is sustainable and affordable given the expected future profits of the business. A reduction in the dividend paid is seen by many as a last resort. This means that some investors like to weigh up the value of a share based on the hard cash – the dividend – that ends up in shareholders’ pockets. Once paid, a dividend cannot be taken away and represents a tangible return on owning the shares which isn’t dependent on the ups and downs of the stock market. Lots of investors buy shares for their dividend income as a source of money to live off as well. The current dividend is unsustainable and will be cut or cancelled. Future dividends won’t grow very much. I’ll say more on these topics in the chapter on dividend investing. Let’s look at the dividend yield of Tesco as an example. 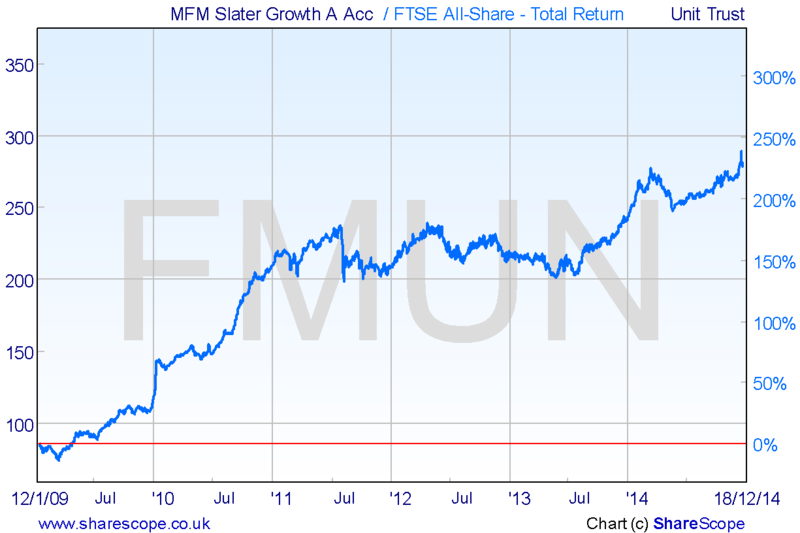 In 2014, it paid a dividend of 14.8p per share. Based on a current share price of 230p, this gives the shares a dividend yield of 6.4%. That looks quite attractive. But wait. Just as with earnings, we need to pay attention to what future dividends will be. The 6.4% dividend yield for Tesco might be attractive if its dividend is sustained or it increased. To look at this, you calculate the dividend yield on a prospective or expected basis. If you have been working your way through this book, then you will know by now that Tesco’s profits have been falling are expected to continue doing so for a while. The forecast dividend for 2015 is expected to be just 1.2p per share. This gives it a yield of just 0.5%, making the shares look a lot less attractive on this measure. A couple of chapters ago, we looked at why for some investors cash is king. They don’t trust profits as much because they can be manipulated. As a result, they are not as interested in comparing the price of share with the earnings per share. They want to weigh it up against its free cash flow per share – the cash equivalent of the PE ratio. As with the PE ratio, you can turn this calculation upside down to get the free cash flow yield. Tesco free cash flow has been very low and so it does not stack up well on this measure. It has a price to free cash flow of 60.8 times or a free cash flow yield of 1.6%. A sustainable free cash flow yield of 10% or more might be seen as an attractive share. You can also use a free cash flow yield to do a quick check on the sustainability or otherwise of a company’s dividend. Ideally you want to invest in a company where the free cash flow yield is more than the dividend yield to have a degree of comfort that the company has enough spare cash to pay you. Some investors prefer to look at a company’s asset values instead of its profits or free cash flows. The main reason for this is that the asset values on a company balance sheet tend to be more stable than profits or free cash flows. There may also be some assets that have some value but do not currently produce profits or free cash flow. So by comparing the value of company against its assets you may be able to find undervalued shares. The measure of price to net asset value (NAV) is sometimes referred to as price to book value. As we saw earlier, a company’s net asset value is its total assets less its total liabilities. It can be seen as a measure of what the company would be worth if all its assets were sold off and all its liabilities were settled. Asset values are overstated (i.e. they can’t be sold for the value on the balance sheet). Assets are obsolete or out of date. The assets cannot produce sufficient profits as evidenced by a low return on assets (ROA) or return on capital employed (ROCE). That said – as I will talk about in the chapter on value investing – value investors have been able to make big profits by buying shares in companies trading at a big discount to their NAVs. Tesco’s NAV per share based on its last annual accounts was 182.2p. At a share price of 230p, this equates to a P/NAV of 1.26 times which suggests that Tesco shares are not in bargain territory. As with most ways of valuing shares, NAV or book value is not without its drawbacks. The main problem with NAV is that it can have a large value of intangible assets such as goodwill or brands which are very difficult to value. The way round this issue is to compare the share price with the tangible assets per share instead (land, buildings, stocks, trade debtors etc less all liabilities). If you can buy the shares of a company for less than this value then you are arguably being more conservative and stand a better chance of making money. Tesco’s tangible asset value per share from its last annual accounts was 135.2p. At 230p, the shares trade on a P/NTAV of 1.7 times which suggests that conservative value investors might find them a bit too dear. You can get a reasonably good idea of whether a share could be good value or not by looking at the basic measures that have just been described. However, if you want to take your analysis up to a more advanced level and gains some more valuable insights into a company, then SharePad provides some more sophisticated ways of valuing them. In this section, I am going to expand a bit more on how PE ratios can be tinkered with to get some better measures of company value. I’ll then move on to the old problem of debt and how this can trick investors before finishing off with a formula used by one of the all time great investors – Benjamin Graham. So what on earth is a PEG ratio? In its most simplest form it is the price to earnings ratio (PE) of a share divided by the expected growth rate in earnings per share (EPS). A share with a PE ratio of 15 and expected earnings growth of 20% has a PEG ratio of 0.75 (15 dividend by 20). Another share also with a PE of 15 and expected earnings growth of 5% has a PEG of 3 (15 divided by 5). As I’ll explain later, the share with the lower PEG would usually be seen as the better one to buy. PEG was developed because of the perceived limitations of just relying on PE ratios alone. By comparing the PE of a share with the expected growth rate in earnings it might just be possible to buy great, fast growing companies at a reasonable price and make a lot of money. PEG came to prominence as a winning strategy when it was used by the successful US investor Peter Lynch during the 1970’s and 1980’s. Between 1977 and 1990, Lynch ran the Fidelity Magellan investment fund and trounced the stock market with returns that averaged 29% per year. In the UK, PEG was championed by investor Jim Slater in his book The Zulu Principle. Most of the time the stock market is pretty smart. Companies that are growing their profits rapidly tend to be valued at a high multiple of current profits – they have high PE ratios. However, by comparing the P/E ratio with the expected growth rate in earnings, shares that might look very expensive on PE ratios alone could actually turn out to be undervalued gems. To see why this might be so, consider the following fictional company below and see how earnings growth and PE ratios help to determine share prices. Bob’s Bike Shop has been growing rapidly during the last five years and is expected to keep on doing so in the years ahead. Its shares trade on a PE of 15 which is in line with the general stock market and so appears to be reasonably valued – neither too cheap nor too expensive. If the shares continue to command a PE of 15 over the next three years the share price will go up in line with earnings growth and an investor will almost double their money. That sounds good. But the likes of Lynch and Slater argue that the high rates of earnings growth should command a higher PE ratio. A simple rule of thumb is that a company growing its profits or earnings at 25% could be expected to see its shares trade on a PE ratio as high as 25 (the same as its expected growth rate). This would result in a ratio of PE to earnings growth or PEG of 1. This would happen if the market re-rates the outlook for the company and bids the share price up. If this were to happen to the shares of Bob’s Bike Shop above then its share price will be even higher in three years’ time. This is because its EPS will have a higher PE multiple applied to them. Jim Slater suggested buying shares with a PEG ratio of much less than 1. He tried to buy shares where the ratio of the PE to expected earnings growth – the PEG – was two thirds or less. In other words, a PEG ratio of 0.66 or less. This way he reasoned that he could buy before the rest of the market worked out what a good investment a company was. Something like Bob’s Bike Shop for example. Does PEG work in the real world? This all sounds well enough in theory but does PEG really help investors to make a lot of money? There aren’t that many published studies that have looked at how good the PEG ratio is at picking winners. In his 1996 book, Beyond the Zulu Principle, Jim Slater posted some compelling evidence that buying shares with a PEG of 0.6 or less during 1995/96 beat the market handsomely. But that was nearly twenty years ago and over a very short time period. SharePad calculates five different types of PEG ratio ranging from a simple version to more sophisticated ones. I’m going to look at three versions using SharePad data on a leading FTSE 100 share and will use BT (LSE:BT.A) as an example. That’s because SharePad isn’t giving a PEG value for Tesco given the fact that it’s EPS is expected to shrink rather than grow. Don’t worry if these calculations start to look a bit complicated. You just have to understand the logic behind them. SharePad will do all the number crunching for you. This is calculated using the historic PE ratio (share price/last annual normalised EPS) and dividing it by the expected growth rate in earnings for the next year. So BT has a PE of 15.9 and an expected one year growth rate in earnings per share of 13.4% giving an historic PEG ratio of 1.19. (15.9 divided by 13.4). Some people prefer to calculate a PEG ratio based on forecast (or projected) PE ratios and earnings growth rates. This is because past profits are known. The future is what really matters. Using projected values might therefore give the investor an edge. You calculate a projected PEG by taking the forecast PE ratio (share price/forecast normalised EPS) and the forecast EPS growth rate in one year’s time. The forecast EPS growth rate to use is the forecast two years out (30.3p) compared with the forecast for one year’s time (28.8p). For BT this is 5.21%. With a projected PE of 14.0 this gives a projected PEG ratio of 2.7 (14.0/5.21). Slater argues that if you are comparing projected PEG ratios between two companies it is important that you are basing them on the same timeframe – one whole year ahead. For example, if it is March and a company’s year end is December there is really only a 9 months’ forecast potentially being used. To get round this you can calculate what is known as a rolling PEG based on one year rolling EPS figures and growth rates. SharePad calculates this figure to the nearest day (based on 252 trading days in a year). I am being slightly lazy in order to make the calculation easier to understand. My figures will be therefore slightly different to the ones that you will find in ShareScope. Taking the case of BT. It has a March year end and we are currently near the end of December. So to calculate a rolling EPS figure you take the historic EPS of 25.4p (March 2014) and multiply by 0.25 (three months) and the following year’s forecast of 28.8p (March 2015) and multiply by 0.75 (nine months). This gives a rolling EPS forecast of 28.0p. To get the rolling EPS growth rate you have to move the process forward one year. Take the 2015 forecast EPS of 28.8p and multiply by 0.25 and the March 2016 forecast EPS of 30.3p and multiply by 0.75 to get a figure of 29.9p. The rolling EPS growth rate ((29.9/28.0)-1)) is 6.78%. The rolling 1 PE is 14.4 (404/28.0) and the PEG is 2.13 (14.4/6.78). Given these three PEG figures it would seem unlikely that someone such as Jim Slater would be a buyer of BT shares at the current price. That’s not to say that the shares might not look attractive on other measures. PEGs should only be used with genuine growth companies. Look at the past five years and make sure that profits have been growing strongly. Avoid cyclical companies (e.g. house builders or engineers) whose profits move up and down in line with the economy. PEG may work better with smaller companies that are less extensively researched by City analysts. The lower the PE, the better. This gives you a better chance of making money from the market re-rating the company to a higher PE when profits keep growing. Avoid very high PEs. Share prices of high PE companies can fall sharply if profits disappoint. Slater thinks that PEG works best with PEs between 12 and 20 and earnings growth of between 15-25%. Pay very close attention to analysts’ forecasts. This is a key part of the PEG strategy. ShareScope has a list of forecasts for you to look at. Check when the forecasts were last updated and then see when the last piece of significant news about the company was released. Out of date forecasts lower the value of any PEG ratio. Looking at the market as a whole, forecasts tend to be optimistic but they are all we have to go on. How are the company’s earnings growing? Make sure that it is by selling more goods and services (sales growth). This is genuine growth. EPS can grow through less sustainable means such as cost cutting, buying other companies or spending lots of money on new assets but getting low returns. Make sure that EPS growth in the past has been backed up by a stable or growing ROCE. Share buybacks often boost EPS but this can be a poor source of growth. It is quite possible that you will not find many – or any – shares that meet a PEG criterion. This may be telling you that the stock market itself is getting quite expensive. This is not a problem. As a private investor you are not under pressure to buy shares all the time. You can wait until shares become cheaper and build a watchlist of shares in the meantime. PEG has been criticised for discriminating against shares where earnings aren’t growing particularly fast but pay a substantial dividend. To get round this the PEG can be adjusted to take into account the dividend yield of the shares as well as the expected growth rate in earnings. This ratio is known as the PEGY (pronounced “peggy”). This measure was talked about in Peter Lynch’s book One up on Wall Street. Like the PEG ratio, we want a low PE and a high forecast growth + yield – so the lower the PEGY value the better. Many successful investors insist on being conservative and building in a buffer – often expressed as a margin of safety – when buying shares. This was the key theme behind legendary value investor Benjamin Graham’s strategy. He suggested that investors base the price they are prepared to pay for a share on the average of its last seven to ten years’ earnings. He argued that by doing this you reduced the chances that you are overpaying for a company based on a temporary boost in current profits – something that became very evident during his time investing during the 1930’s depression. In his books he introduced rules such as not paying more than twenty five times the 7 years average profits of a company. But I’m not sure many analysts or investors think like this nowadays. That said, using average profits to value the market as a whole has been attracting more attention in recent years. Graham’s idea was revived by Robert Shiller in the late 1980’s and he used it to convincingly argue that the American stock market was significantly overvalued during the late 1990’s. Shiller takes the current value of the S&P 500 index and divides it by the ten year average profits of the index adjusted for inflation – so profits made ten years ago are increased to reflect the increases in inflation since then. The resulting figure is known as the cyclically adjusted price earnings ratio (CAPE) or sometimes PE10. SharePad calculates a CAPE for individual shares but uses a slightly different calculation (see the SharePad Help for details). SharePad will use ten years data where available but no less than eight. If you can buy a company with a low CAPE then you may be on to a bargain. Bear in mind that eight years may not take in the ups and downs of an economy so you need to take some care when looking at CAPE figures. It’s also worth bearing in mind that companies can change a lot over eight years say by buying into different business that perform differently in relation to the economy. It also might be the case that company profits may not rebound or fall back. Having said that, for certain companies – such as manufacturers or housebuilders – where profits do tend to move up and down with the economy, CAPE can be a useful measure to look at. As you can see above, the earnings per share of house builder Barratt Developments has been very volatile. Over the ten years from 2005-14, it has ranged from a peak of 77.9p to a loss of 78p. Such wild swings in profits can make its shares very difficult to value. This is where CAPE can come in handy. 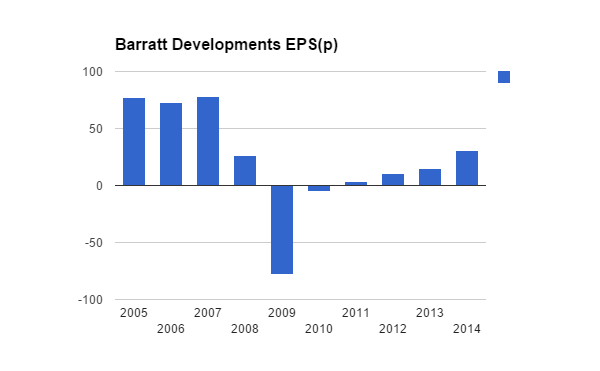 By smoothing out the earnings to get an average EPS figure adjusted inflation you can get a better feel for Barratt’s valuation. Using a PE ratio when profits are temporarily high or low will probably confuse you. 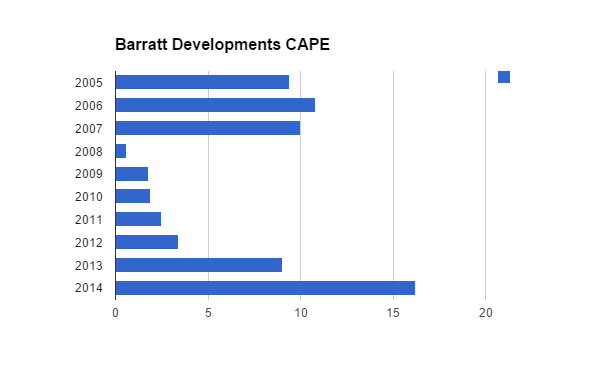 What we can see with a CAPE is that Barratt Development shares looked very cheap between 2008 and 2011. But they look more expensive based on the 2014 figures if history repeats itself and profits move between boom and bust. As we saw in the previous chapter, if a company finances itself with some debt then some ratios such as return on equity (ROE) can get distorted. Debt can make you think that something is better than it actually is. The same is true with PE ratios. Debt lowers PE ratios, whereas having no debt and lots of cash increases them. As I’ll explain in a minute, if you think that a company with debt is cheaper than one without you might be making a mistake. That’s why SharePad has some different valuation measures to help get round this problem. They are based on a company’s enterprise value (the value of its equity and debt together) or EV for short. These valuations are arguably more powerful and are often used by professional investors. Wesley Gray, an American who is a bit of an expert on value investing has done a lot of research into the best valuation measures to pick winning shares. As far as he is concerned, the best measure is to compare a company’s earnings before interest and tax (EBIT) – or trading profits – with the enterprise value (EV) paid for a company (the market value of its equity plus its debt minus its cash). This gives an earnings yield for the whole business expressed as an interest rate. The higher the interest rate, the cheaper the share. He’s not the first person to advocate this measure. Joel Greenblatt, the author of The Little Book That Beats the Market uses it as a key part of his magic formula of picking shares (more on this later in the book). His aim is to rank shares by their interest rates and return on capital. He reckons this allows him to buy good quality businesses (signalled by a high return on capital) at a cheap price (with a high interest rate). You can find Greenblatt’s magic formula in SharePad. The reason that EBIT/EV (or EV/EBIT) works so well is that gives you a lot of information about what you are paying for the assets of a business or enterprise value (which are financed by its equity and its borrowings) and the profits that are actually produced from them – EBIT. If you just concentrate on the equity of a business you could make mistakes and buy the wrong business or pay the wrong price. Basically debt makes shares look cheaper on a PE and can fool people into thinking shares are cheap when they are not. Let’s say there are two identical office blocks for sale where you live. Both have an asking price of £1 million and both have annual trading profits of £100,000. The first office, known as Market Place is financed with a £800,000 bank loan at an interest rate of 5% leaving it with remaining equity left over of £200,000 (£1m less the bank loan of £800,000). Park Square has no debt at all, so has an equity value of £1 million. Their finances are shown in the table below. By using PE ratios you could be mistaken for thinking that Market Place is considerably cheaper than Park Square when in fact on the basis of EBIT/EV they have the same value. Gray says that the EBIT/EV consistently picks better stocks. He looked at the shares of 1000 large and medium sized companies between 1963 and 2013 and ranked them into deciles based on their EBIT/EV ratios. He then put together lots of random 30 stock portfolios. What he found was that buying the cheapest shares handsomely beat the more expensive ones. Not only that, but they were also much less risky with lower levels of volatility. According to Gray, the magic from Greenblatt’s magic formula all comes from the EBIT/EV part. Focusing on high returns on capital can lead to investors over paying for quality. It’s therefore better to just buy shares with a high interest rate on the basis of EBIT/EV. If you prefer to work with numbers rather than yields or interest rates you can use the EV/EBIT measure. Cheaper shares have low numbers on this measure with higher ones for more expensive shares. SharePad also calculates a debt-adjusted PE. Here the EBIT is taxed at the UK or US company tax rate and divided into its enterprise value. As you can see, Market Place and Park Square have exactly the same debt-adjusted PE which is how it should be. The great thing about using debt-adjusted PEs and EBIT/EV is that it can stop you buying shares that look cheap on a PE measure but aren’t – they just have more debt. It can also tell you that companies with lots of cash and no debt are cheaper than they look on a PE measure. This means that you might buy some shares of a company that you might otherwise have ignored. This is a formula devised by the legendary investor Benjamin Graham. It comes up with a price that is the maximum amount that a conservative investor should pay for a share. It is based on a company’s earnings per share (EPS) and book or net asset value per share. You might be thinking where does the number 22.5 come from? It is based on Graham’s view that the maximum PE ratio to be paid should be no more than 15 times the last reported annual EPS. The maximum P/NAV should be 1.5 times (15 x 1.5 = 22.5). So for Tesco, the last reported EPS was 28p and the last reported NAV per share was 182.2p. If we plug that into the formula we get a maximum price to pay for Tesco shares of 338p. This compares with a share price at the time of writing of 230p. Comparing these two prices gives us the Graham ratio. For Tesco, the Graham ratio is 0.68 which means that the shares are 32% (1-0.68) below the maximum price to pay suggested by the Graham number. Does this mean that Tesco shares are cheap? Not necessarily. As we know EPS and NAV values can change. With EPS expected to be much lower in 2015 than 2014, the Graham number for Tesco is likely to fall significantly.